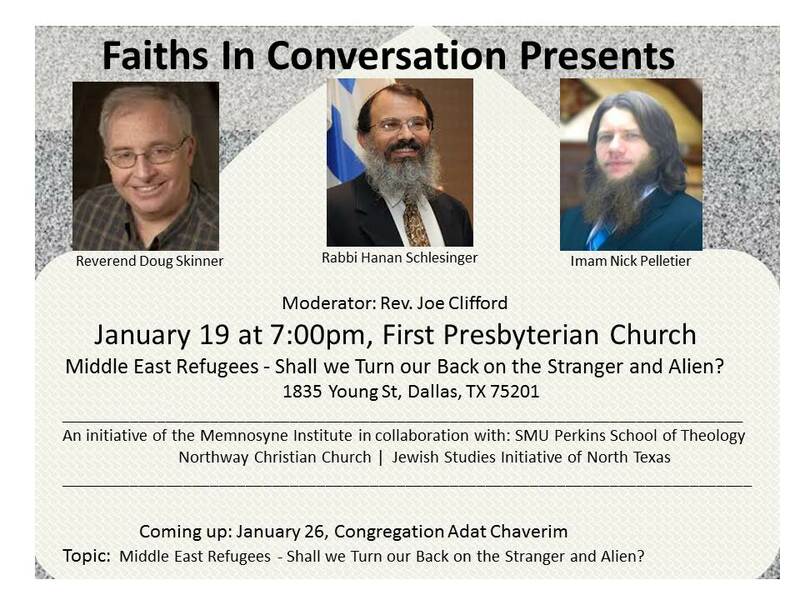 January 19 - Imam Nick Pelletier, Pastor Doug Skinner, Rabbi Hanan Schlesinger; First Presbyterian Church of Dallas; "Middle East Refugees - Shall we turn our back on the stranger and alien?" January 24 - Rev. Joe Clifford and Rabbi Hanan Schlesinger; First Presbyterian Church of Dallas; "Jesus and the Commandments through Jewish Eyes"
January 26 - Imam Zia Sheikh, Pastor Doug Skinner, Rabbi Hanan Schlesinger, Dr. Robert Hunt; Congregation Adat Chaverim; "Middle East Refugees - Shall we turn our back on the stranger and alien?" February 7 - Rev. Doug Skinner and Rabbi Hanan Schlesinger; Northway Christian Church; "Jeremiah’s New Covenant Through Jewish and Christian Eyes"
February 9 - Imam?, Pastor Doug Skinner, Rabbi Hanan Schlesinger, Dr. Robert Hunt; Congregation Adat Chaverim; "The Struggle to Maintain Communal Religious Identity in a Secular Society"
March 29 - Dr. Mohammed Lazzouni, Pastor Doug Skinner, Rabbi Hanan Schlesinger, Dr. Robert Hunt; Congregation Beth Torah; "Sharia/Halacha/Church Law in Secular America"
April 12 - Imam Nick Pelletier, Pastor Doug Skinner, Rabbi Hanan Schlesinger, Dr. Robert Hunt; Islamic Association of Irving; "Religious Extremism and Violence"
Rabbi Schlesinger spoke and taught at a number of venues in Maryland and Virginia. On February 5, he was a guest of the Oakbrook Church in Reston Virginia. Guided by one of its pastors, John Moyle, the church is an ardent supporter of Israel and at the same time of Palestinian Israeli rapprochement. John has been instrumental in helping Rabbi Schlesinger to move forward in his work in Israel of building bridges of understanding and friendship between Palestinians and Israeli settlers. Building upon their collaboration, John invited the rabbi to speak to the church about his personal path as a Zionist and a settler who is both deeply committed to the Land of Israel and to peace and understanding between Jews and Palestinians. Topic: Internal Schism: What Divides Our Communities from Within? May 19, 2014 at Congregation Beth Torah. In case you missed the event, and even if you didn’t, you can click here to read Rabbi Schlesinger’s presentation. To listen click here. Topic: Deed and Creed, Works and Faith. In case you missed the event, and even if you didn’t, you can click here to read Rabbi Schlesinger’s presentation. To listen click here. For sources click here. Topic: Proselytizing, Conversion and Salvation Outside of the Faith. In case you missed the event, and even if you didn’t, you can click here to read Rabbi Schlesinger’s presentation at the event. January 20, 2014 at Northway Christian Church. Topic of Sacred Space and Sacred Place in Judaism, Christianity and Islam. The trialogue partners were Rabbi Hanan Schlesinger, Rev. Dr. Doug Skinner, and Mr. Alif Rahman; the event was moderated by Dr. Robert Hunt. Rabbi Schlesinger maintains connections not only with Evangelical and conservative churches, but also with mainline and liberal Protestant denominations. One of these connections is with the Central Congregational Church affiliated with the United Church of Christ. On Monday night, November 11, Rabbi Schlesinger gave a dialogue program there with Steven Wilson, a pastoral intern and veteran attorney, on the subject of Divine Justice, Mercy, and Forgiveness. Religious and political leaders from the Middle East and around the world discuss geo-political-religious issues facing us around the globe. One of the many sessions of the Global Faith Forum featured Rabbi Schlesinger and his Faiths in Conversation dialogue partners, Rev. 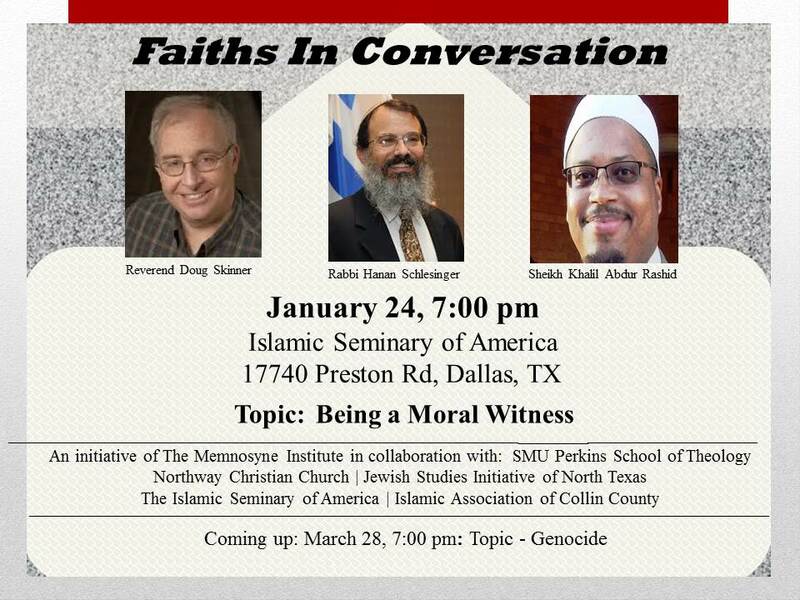 Doug Skinner and Imam Zia Sheikh. An additional session was a trialogue with Rabbi Schlesinger and his neighbor in Israel, Dr. Jack Sara, president of the Bethlehem Bible College, together with Evangelical journalist Dale Hanson Bourke. HERE and HERE are links to two newspaper articles about the Global Faith Forum. 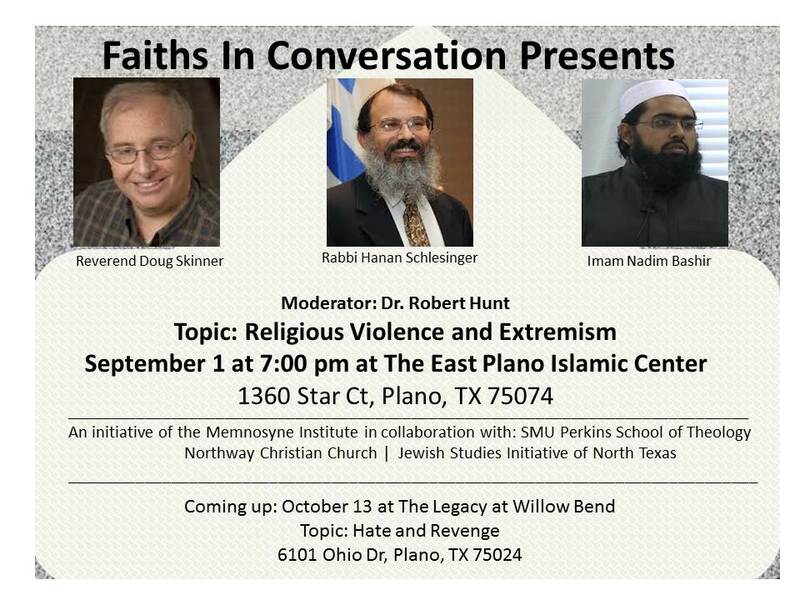 VIDEO The November Faiths in Conversation program focused on the subject of war and took place in Keller Texas within the framework of the Global Faith Forum. The trilogue begins at the 28th minute, Rabbi Schlesinger’s comments begin at the 30th minute. 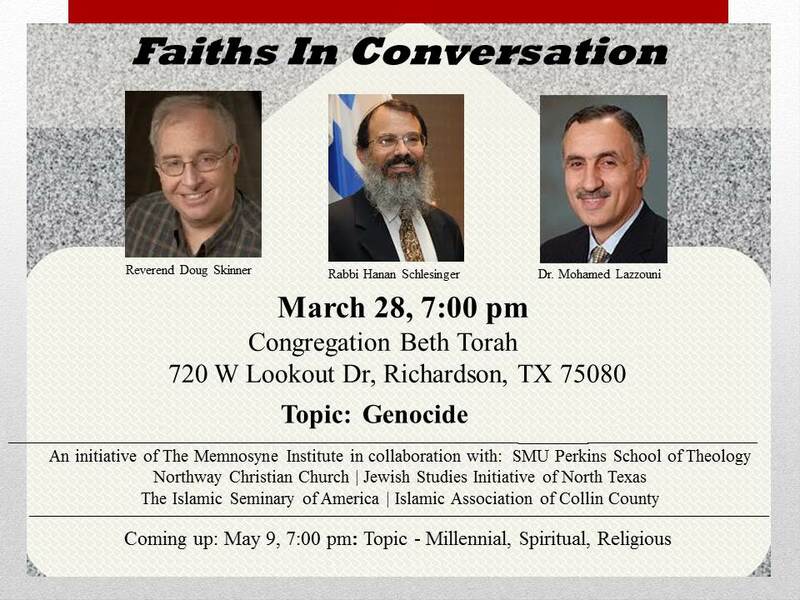 Topic: Death and Dying in Judaism, Christianity and Islam. The trialogue partners were Rabbi Schlesinger, Rev. Dr. Doug Skinner, and Mr. Alif Rahman. 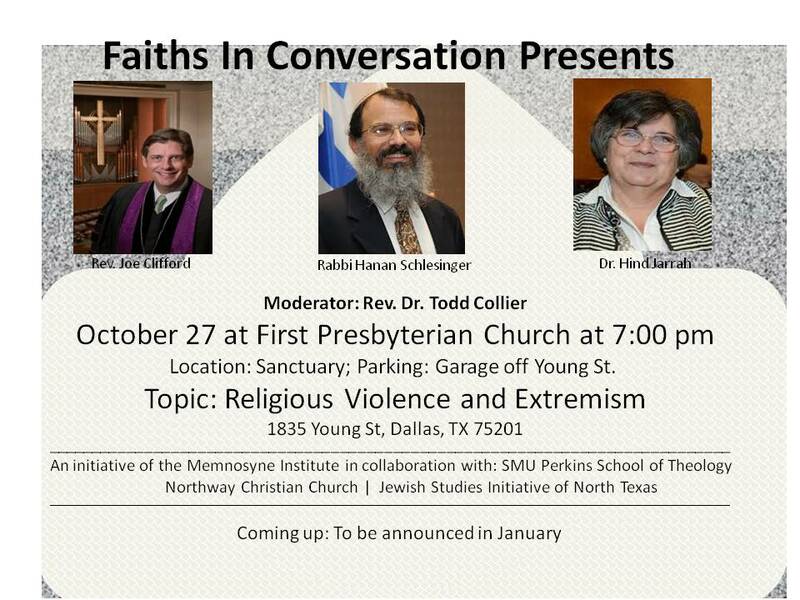 October 7th, 2013 kicked off a horizon-widening, no-holds barred, interfaith dialogue series with Rabbi Schlesinger, Rev. 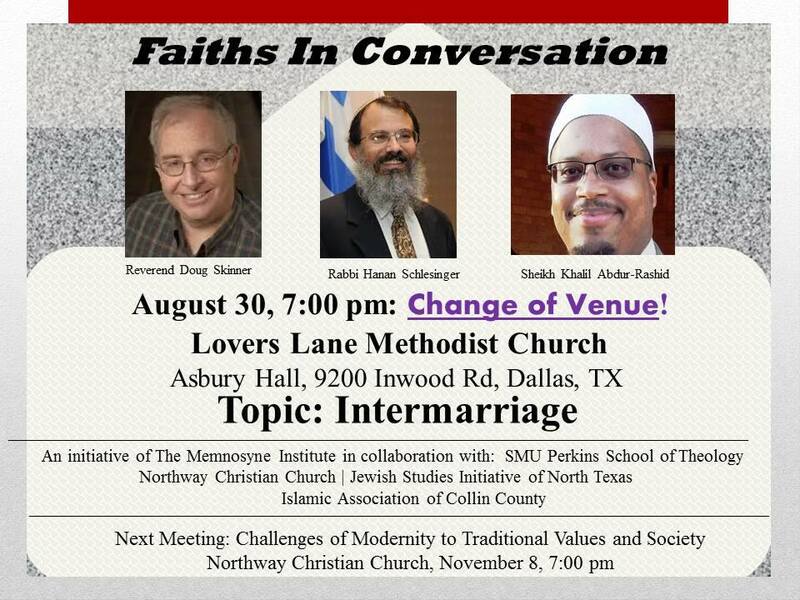 Dr. Doug Skinner and different Muslim leaders from the Metroplex. The first event of this year’s series featured our first female speaker, Dr. Nia Mackay, who presented the Muslim view as the 3 speakers grappled with Divine Justice, Mercy, and Forgiveness. Reverend Dr. Doug Skinner and Rabbi Hanan Schlesinger held an open discussion among friends about the things most important to them. Doug, a bible believing conservative Christian scholar, and Hanan, an orthodox rabbi, might seem to be worlds apart, but as their friendship has blossomed they have come to learn that remarkably, they share a common understanding of religion and a common vision for humanity. Discussion touched on Hebrew Scripture, the New Testament, God, faith, tradition, Jews, Christians, and modernity. May 29th, 2013 at the Northway Christian Church. Together with Rabbi Schlesinger, the presenters Rev. 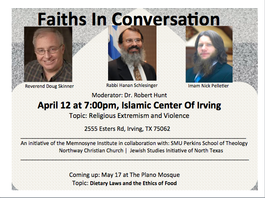 Doug Skinner and Imam Zia Sheik, the spiritual leader of the Islamic Center of Irving brought their perspectives to the topic. CLICK HERE for 10 YouTube videos from previous Faiths in Conversation events. CLICK HERE for source sheets for The Rationale Behind Interfaith Dialogue. CLICK HERE for audio recording The Rationale Behind Interfaith Dialogue. CLICK HERE to read an insightful article published in the Huffington Post by Rabbi Eric H. Yoffie, “Why Interfaith Dialogue Doesn’t Work – and What We Can Do About It.” The article describes what we had in mind when launched the new interfaith dialogue series, Faiths in Conversation. 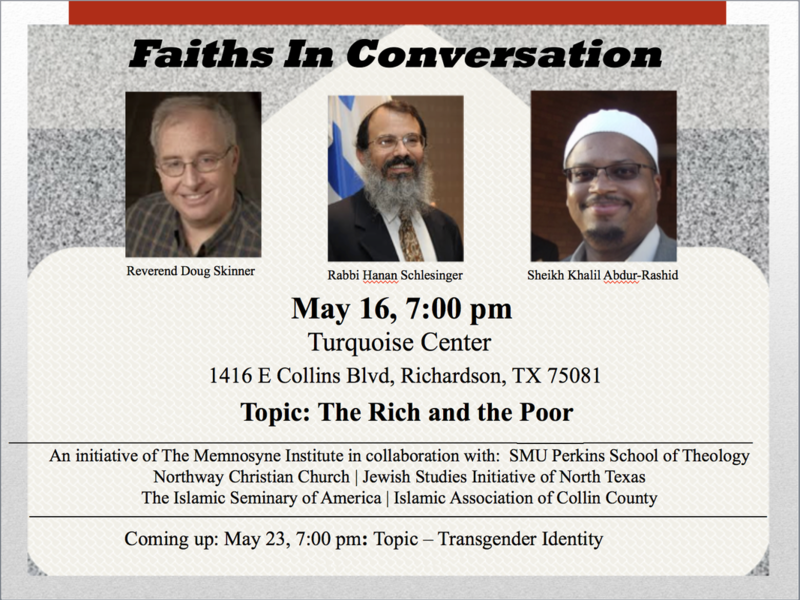 April 18, 2013 at ​The Institute of Interfaith Dialogue at Southern Methodist University. Rabbi Schlesinger presented a Jewish perspective on the subject of “Life After Death”. CLICK HERE for audio recording Life After Death. 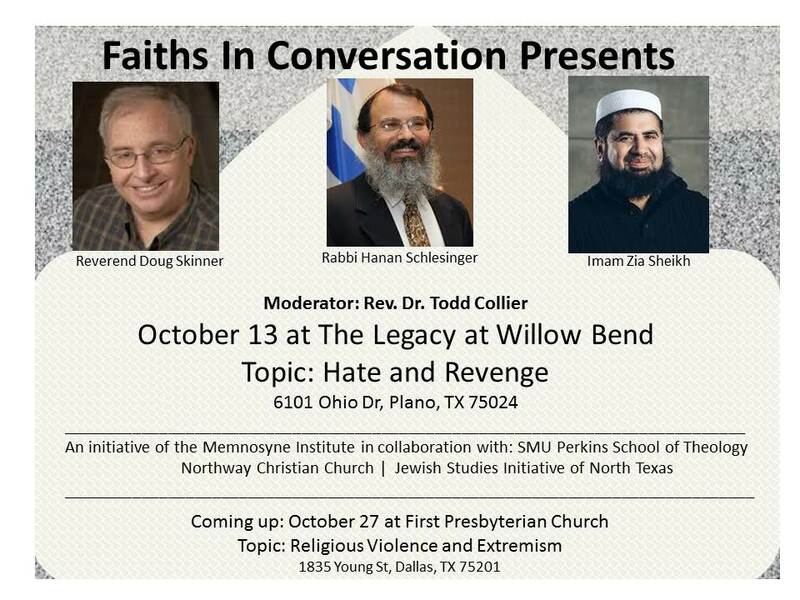 Rabbi Schlesinger’s presentation begins at 18 minutes. 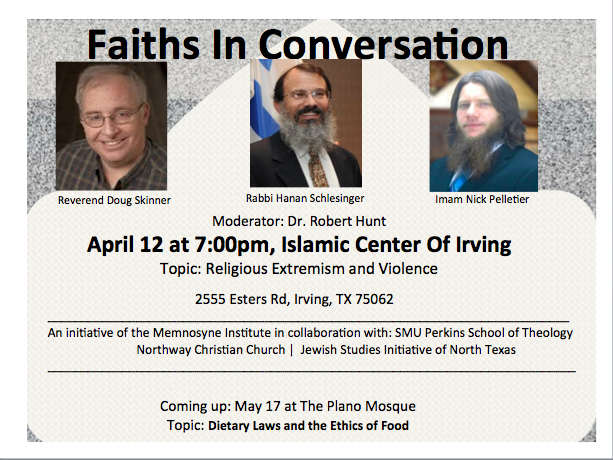 April 10th, 2013 at the Islamic Center of Irving. Rabbi Schlesinger and his Christian and Muslim colleagues discussed the subject of prayer in the three monotheistic religions. The honest, insightful and enlightening presentations revealed many similarities and many differences between prayer in the three faiths, and grappled as well with the question of interfaith prayer. The participants were also able to observe an authentic Muslim prayer service. Jews, Christians and Muslims who attended learned to open their hearts and understand the other just a little bit better. The event was successful far beyond our expectations! The discussion explored how service has been beneficial to communities across cultural and religious traditions over the centuries, linking up to the current researched benefits of being of service as a therapeutic model. Dr. Hal Barkley, LMFT, LPC. Director of the Masters in Counseling Program at SMU. Clinical Associate Professor. Dr. Robert Hunt. Director of Global Theological Education at SMU. Professor of Christian Mission and Interreligious Relations. Shiraz Hajiani. Lecturer at University of Chicago. PhD Candidate at University of Chicago Department of near Eastern Languages and Civilizations. Masters in Theological Studies from Harvard Divinity School. Rabbi Hanan Schlesinger. Executive Director and Community Rabbinic Scholar of the Jewish Studies Initiative of North Dallas. Pravrajika Brahmaprana. Resident Minister of the Vedanta Society of North Texas. Guest Lecturer, Writer and Editor. February 7, 2013 at the Northway Christian Church. In addition to the Jewish Studies Initiative, the Northway Christian Church and the Bayyinah Institute, this series is sponsored by the Memnosyne Foundation and the Perkins School of Theology at SMU. The first in the series was devoted to the possible tension between Divine Authority and Personal Conscience, and grappled with the question: As a submissive servant of God, should the religious person ever think or act according to his own moral understanding? Jewish, Christian, and Islamic perspectives were shared, respectively, by Rabbi Schlesinger, The Rev. Dr. Douglas Skinner, Senior Minister of the Northway Christian Church, and Ustadh Nouman Ali Khan, founder and CEO of the Bayyinah Institute. CLICK HERE for transcript of Divine Authority and Human Conscience. CLICK HERE for source sheets for Divine Authority and Human Conscience. CLICK HERE for audio recording Divine Authority and Human Conscience. December 16, 2012 at the “Through the Gospels Bible Study” at Northway Christian Church. Rav Hanan offered a Jewish perspective on some of the tension between Jesus and the Jewish community of his time. CLICK HERE for the transcript of A Jewish Perspective of Jesus’s Shabat Violations. CLICK HERE to listen to the audio recording, A Jewish Perspective of Jesus’s Shabat Violations. "Hanukah – A Brief Introduction"
Connecting Our Faiths is an interfaith initiative that brings together Jews, Christians and Muslims to hear the religious leaders of these three faiths talk about their unique perspectives on the foundations of Judaism, Christianity and Islam. CLICK HERE for transcript of Hanukah – A Brief Introduction. November 11, 2012 at the Dallas Convention Center. CLICK HERE to read his impression of the event, set in the context of the November hostilities between Israel and the Gaza Strip ruled by Hamas. CLICK HERE to listen to the audio recording The Jewish View of Muhammad. Click here for the transcript of The Jewish View of Muhammad. Click here to see the source material for The Jewish View of Muhammad. Presenting: Jesus Through Jewish Eyes. Click here to listen to the audio recording Jesus Through Jewish Eyes. Click here to see the source material for Jesus Through Jewish Eyes. Presentation: Reaching the Soul Through the Body – Or Not. One of the most salient characteristics of Judaism is its’ emphasis on man as a physical creature. The body is seen as much more than the repository of the soul, and therefore the world of human action and interaction becomes the central focus. To a large degree Judaism is a regimen for training the body through law and habit, leading to charges of legalism and mindless rote. This presentation, based on biblical and rabbinic texts and modern philosophical writings, explored the foundations, implications and relevancy of Judaism’s unique corporal emphasis. Click here to listen to the audio recording, Reaching the Soul Through the Body – or Not. Rabbi Hanan Schlesinger, Reverend Doug Skinner, and Imam Yahya Abdullah explained the impact of Moses in their respective faiths. The audience learned how Moses established the foundation for the connection between these three faiths and what that means today. Mr. Drew Love from the SMU Perkins School of Divinity, Ms. Bianca Anderson, Dr. Robert Hunt from the SMU Perkins School of Divinity and Dr. Newell Williams from the TCU Brite Divinity School also participated. Click here for the transcript of Rabbi Schlesinger’s presentation Moses – A Jewish Perspective. Over a thousand Christians and upwards of one hundred Jews came together for a fantastic and exuberant show of support for the Jewish People and the State of Israel. This event at the Eagle Mountain International Church was sponsored by CUFI, Christians United For Israel. Click here to view video of Night to Honor Israel. Click here for the Texas Jewish Post Article, United for Israel. 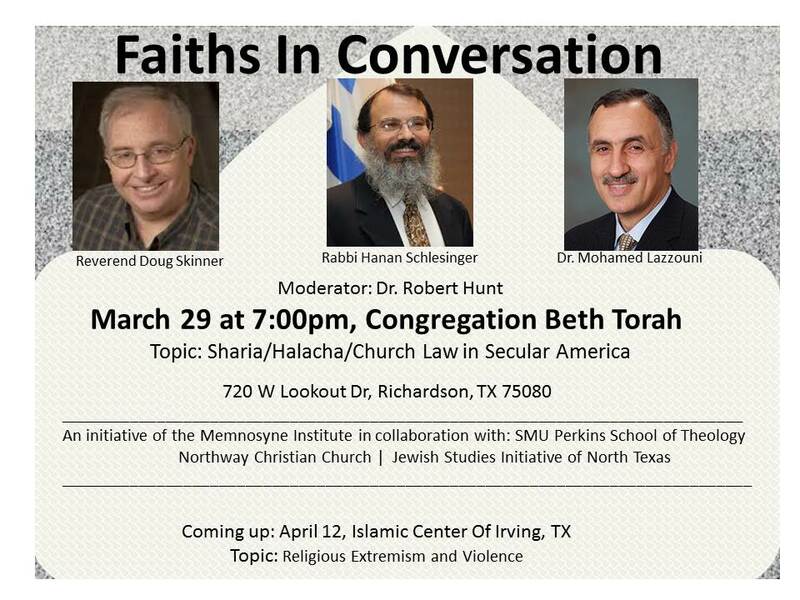 Rabbi Hanan Schlesinger of the Jewish Studies Initiative of North Texas, Reverend Doug Skinner of the Northway Christian Church, and Imam Yahya Abdullah from the DeSoto Islamic Center spoke about the role of Abraham in their respective traditions. Afterward, Dr. Robert Hunt from the SMU Perkins School of Divinity reacted to and commented upon the presentations of the speakers. Click here for the transcript of Rabbi Schlesinger’s presentation, Abraham – A Jewish Perspective. Click here to listen to the audio recording, Abraham – A Jewish Perspective. Rabbi Schlesinger was the featured lecturer at the Old Testament Forum of the Dallas Theological Seminary where he spoke on the Enigma of Noach. October 25, 2011 at Collin County Community College. Featured panelists included: Rabbi Hanan Schlesinger; Yasin Ceren (Dallas Islamic Center); Melissa Mercadante, (Local Spiritual Assembly Chairperson of the Baha’i Faith); Rev. Patrick D. Price, Community Unitarian Universalist Church of Plano; Rev. 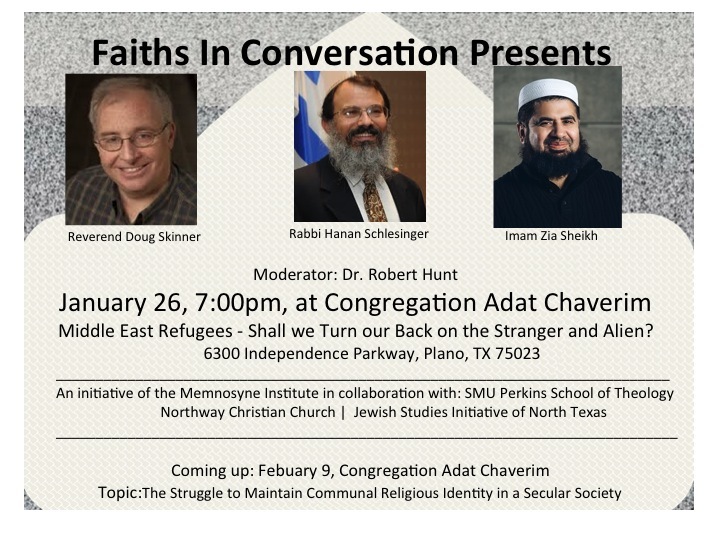 John Thornburg, (A Ministry of Congregational Singing); and Hakan Yagci, (Director of the DFW Chapter of the Institute of Interfaith Dialogue). One of the major themes of Succot is the universal brotherhood of human beings as creations of the Divine. JSI used the holiday to bring Christian and Jewish leaders together informally to eat, sing, and study during the 3rd Annual JSI Jewish Christian Fellowship Gathering in the Succa. Click here to view video of Rabbi Schlesinger’s remarks at the Interfaith Breakfast.